Wow! It's nearly been a year since I last posted here. What a busy year it's been in terms of my freelance writing and editing work. So much so that I haven't had a chance to focus on my own writing. I've been busily working away on client newsletters, blogs, marketing materials and there's been several novels and non-fiction books along the way as well. My workday often begins at 9am and I can often be found still typing away twelve hours later – fueled by caffeine and a genuine love for what I do. And every once in a while, a project comes along that becomes more than just "another project." It's the kind of project that stays on my mind long after I've shut off the PC, plumped up the bed pillows, and turned off the light. It's something special and something that I simply can't discard into the "finished project" pile. It's the kind of project that tugs at your heartstrings and makes you feel a whole new kind of wonderful and something proud to have been a part of. I've recently finished "that" type of editing/proofreading project and it is one that I want to share with you. ...And it is an amazing story, indeed. This autobiography chronicles one mother's experience from pregnancy through to the next 18 months of her daughter's life via a series of heartwarming and thought-provoking blogs. The author takes the reader on an incredible journey—sometimes joyful, sometimes harrowing—that reinforces how a mother's love is unconditional and knows no boundaries. 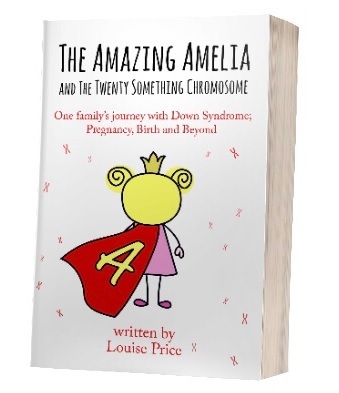 I can't recommend this book enough – whether you have a child or know of a child with Down syndrome, you're a parent or not, or if you are just seeking an inspirational read. So please don't hesitate to check it out and don't forget to share the link with your family and friends. Art the Spiffy Spider celebrates its 5th birthday this month! Stay tuned for a special birthday promotion – a great way to introduce Art to a new audience of young readers. Explore the meaning of friendship and kindness in this colourful children's book that has already been enjoyed by countless children worldwide. Whether you need an article that needs writing, a book that needs editing, or anything that needs proofreading, don't hesitate to contact me for a quote. Makeup Revolution Fast Base Stick Foundation is perhaps the most exciting thing to happen recently in the world of beauty. I ordered mine and here is my review. Wow. It is amazing how quickly time flies when you are having fun. I guess the past year has been busy (and fun!). In fact, I know it has. I've been working hard on my freelance work. I've edited some novels, tweaked some websites, and a lot of other work in between. As a result, my own writing has been put on hold. However, there are a few children's books in the future. And, most recently—as in today—I've started to concentrate on my own article writing once again. You can find my article on tinnitus here. It is a condition that has plagued my life for ten years. It's only now that I felt compelled to share it with the world. Please have a look and feel free to share it with your friends and family. It is likely more people suffer with it than you know. I will also continue to use this space to share any future articles. Topics of interest include health, fitness, beauty, animals ... you'll never know what I'll write about next. Looking for a special gift for a child in your life? Birthday gift for a classmate ... Christmas gift ... "Art the Spiffy Spider" and "Fluffy Cat" are the perfect gift solutions. Available at Amazon in paperback and Kindle formats. Also available at other international Amazon sites. "Fluffy Cat" available for $0.99/£0.99 - Limited Time Only! Snuggle up in your comfy chair with your favourite little person and find out about Fluffy Cat's adventures in "Fluffy Cat". The book is available to download until 25 June for only $0.99/£0.99 from Amazon.com and Amazon UK.